FEBRUARY IS SWEETHEART MONTH! To celebrate your sweetheart, join us for wine, cheese, and fudge tasting at the farm. Beginning February 1, 2019, the farm is open every Friday, Saturday, and Sunday, 10 am to 5 pm. From Tacoma / via Mt. Hwy. Pacific Ave S becomes Hwy 7 South (Mt Hwy) for 16 miles. Turn left at stop light onto Eatonville Cutoff Rd E, veer to the right for approx. 4 miles. Look our sign on the right. Southbound on Meridian for 20 miles. (Meridian becomes 161). Turn right at the Eatonville Cutoff Rd. Drive approx. 1/2 mile past Stringtown Road. Look for our sign on the left. Traveling north on I-5, take exit #111 and go east on SR 510. 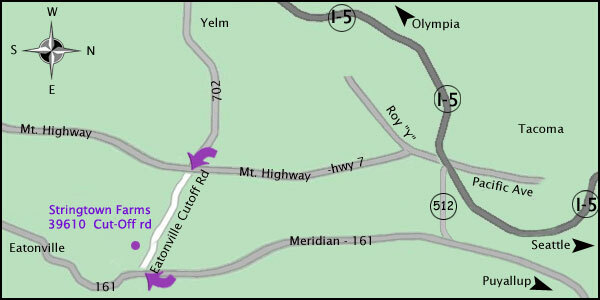 Follow SR 510 for about 16 miles to Yelm. In Yelm, SR 510 becomes SR 507. Continue through Yelm on SR 507 for about 3 miles until you reach McKenna. Turn right at the first stoplight in McKenna onto SR 702. Travel for 10 miles on SR 702 until SR 7. Cross SR 7 (Mt. Hwy) at the stop light and angle right on Eatonville Cutoff Road. Proceed on Eatonville Cutoff Road approx.4 miles. Look for our sign on the right. Our physical address is 39610 Eationville Cutoff Road.